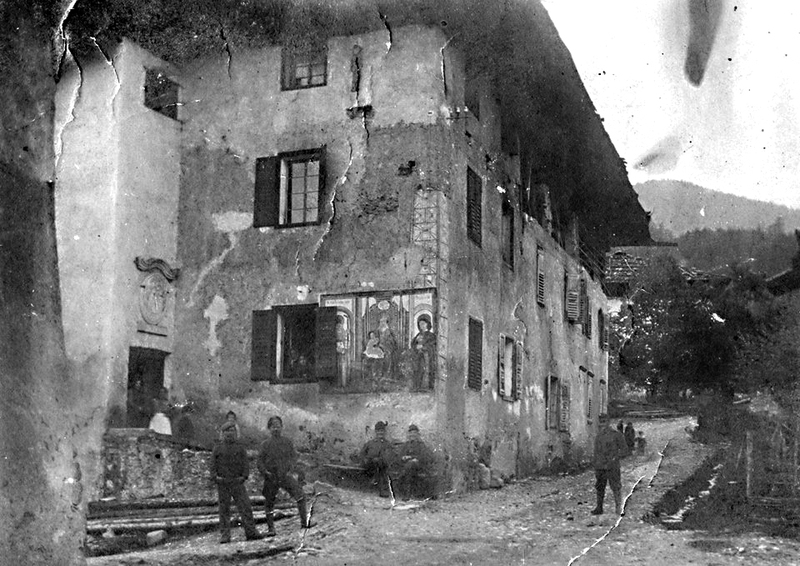 This is what Castelfondo looked like around 1900. Please click on all photos for a larger view. 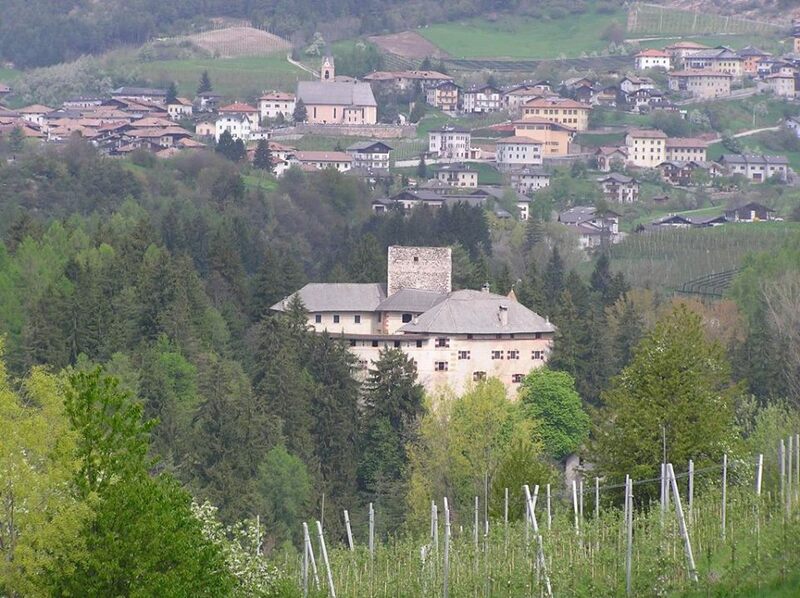 And this is Castelfondo today. Castel Castelfondo (the village castle owned by the noble Thunn family) is visible in the foreground. 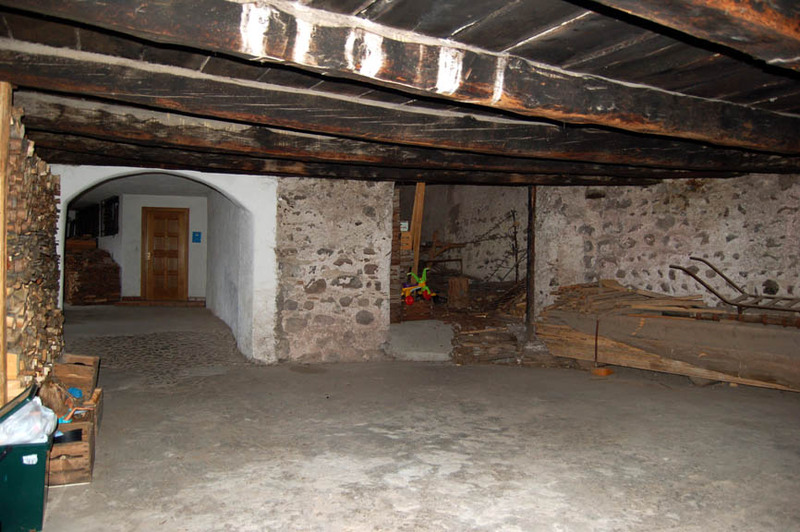 The Genetti Family homestead was constructed sometime in the 1500’s, although it may be older as many homes in Castelfondo date to the 1400’s. The large three-story structure is built in the typical style of that time with an overhanging pitched roof. 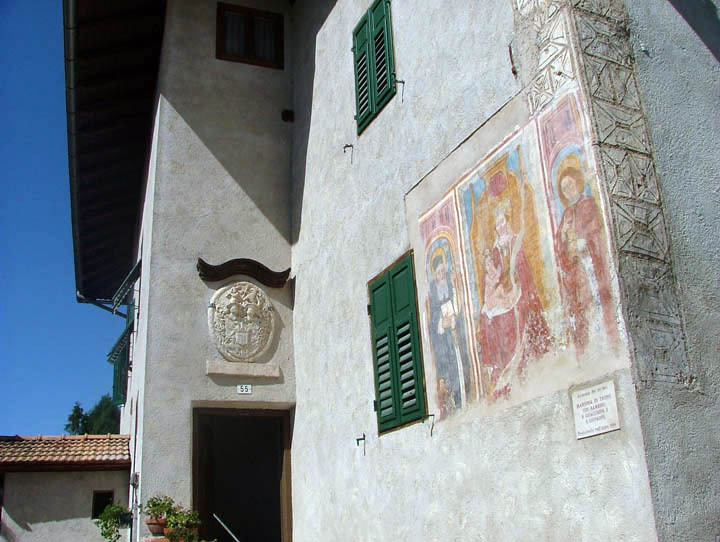 A beautiful fresco graces the wall near the front entrance of the home. This work of art was restored in 1998 with funding provided by Adriana Genetti whose family is associated with the home. The triptych is of a Madonna with Child, flanked by two saints. From an art history perspective, Madonna triptychs were common during the Italian Renaissance, between the 14th to 16th centuries. 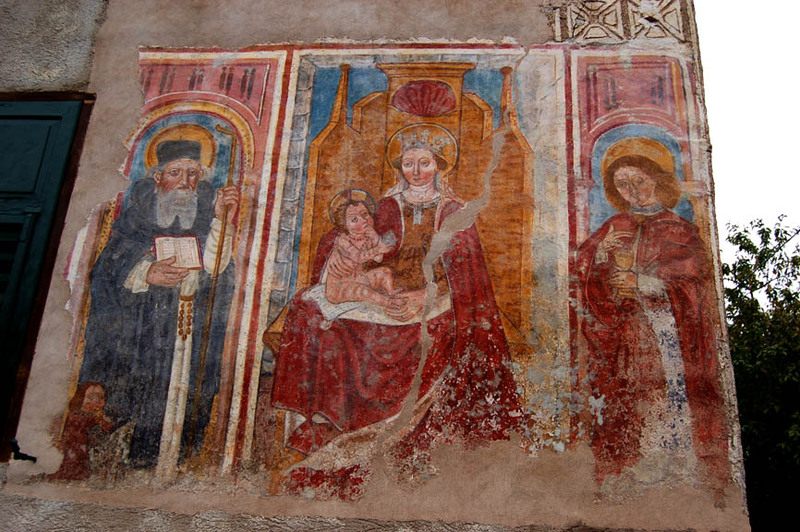 Judging from the fresco’s simple style, flatness and lack of perspective, it was most likely an early work, created sometime in the 1400 to 1500’s, possibly at the time that the house was built. There is no signature or record of the artist or date of creation. Above the fresco can be seen ancient tile work in the shape of crosses. 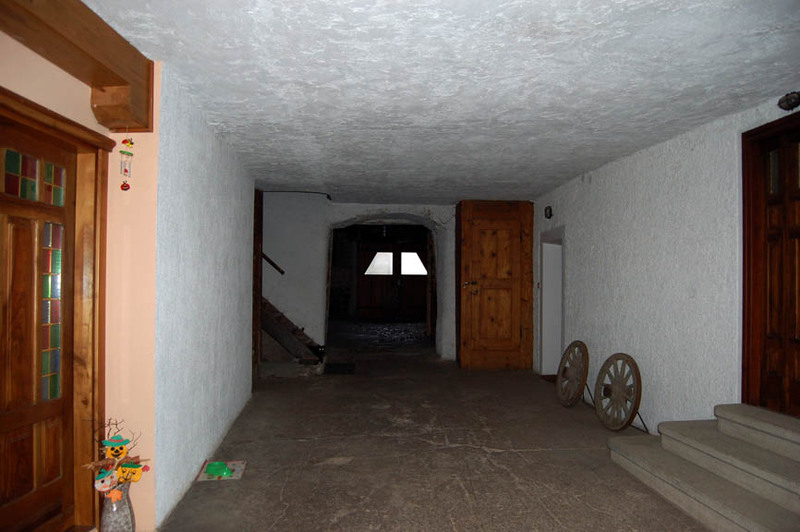 The original first floor of the home served as a barn where livestock were kept. The top two floors were living quarters. The doorways of three apartments are visible. The door on the left was once the apartment of Damiano Genetti. The bottom floor of the Genetti homestead looks very much like it did hundreds of years ago when it was used as a manger for animals. The modern door viewed in the background shows the entrance to another upper floor apartment. 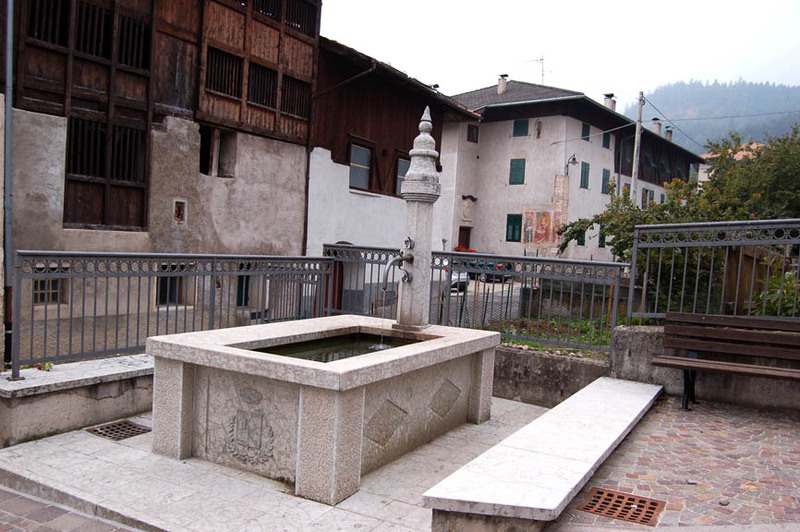 The town fountain is a simple but elegant stone structure containing Castelfondo’s coat-of-arms (see front of fountain). It is situated in the center of town. The Genetti homestead can be seen in the distance on the right. Older photos show the fountain with a covered wooden roof. The structure has been rebuilt several times since the 1500’s. 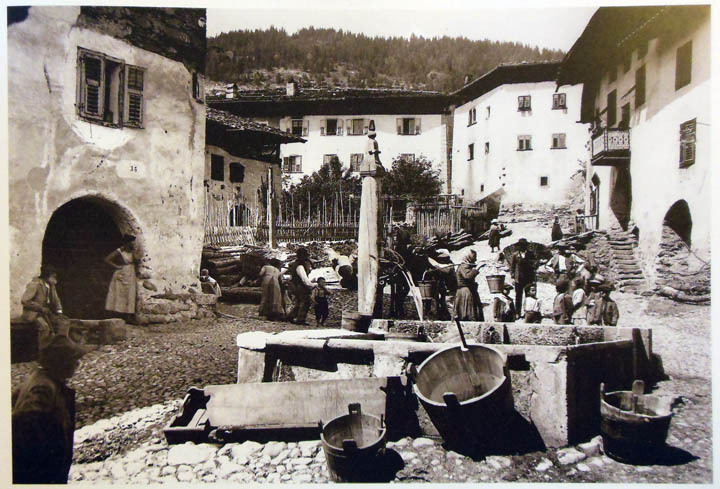 The fountain was once a place of gathering for the village women on wash day and a source of drinking water. 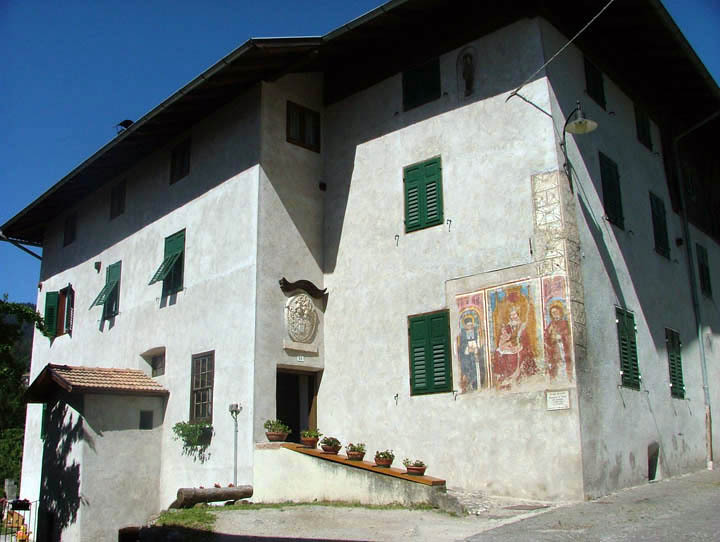 The parish church is San Nicolo, named after the town’s patron saint, Saint Nicholas. Just a short walk from the center of town, its towering facade is easily visible from all directions. The church was built between 1508 and 1530, and enlarged during the 20th century. 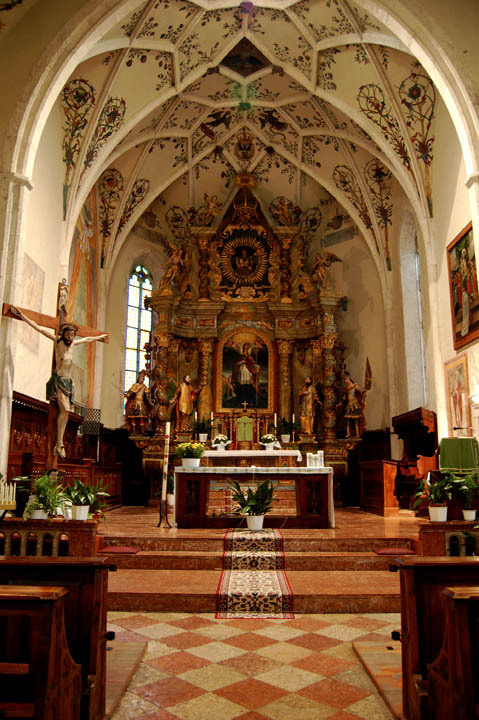 The church contains many frescos that date back to the 16th century, a lovely vaulted painted ceiling, hand-carved wooden crucifix and an ornate baroque alter. At the upper left corner of the altar is the coat-of-arms of the noble family of Thun. 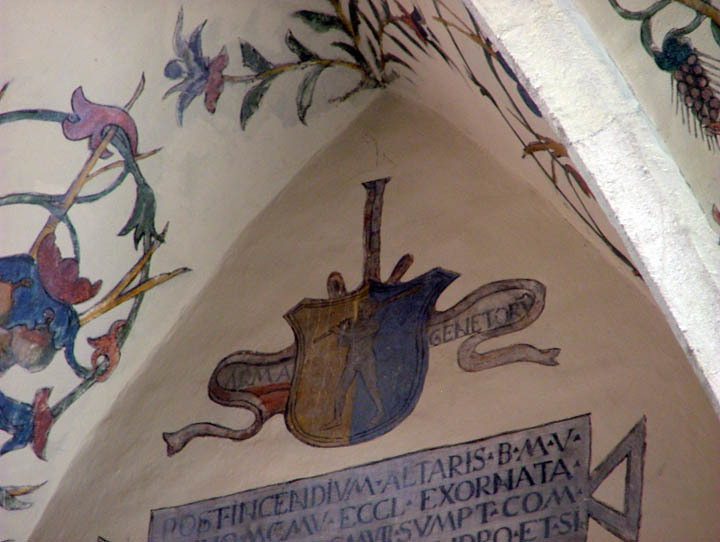 On the opposite right corner of the altar is the coat-of-arms (stemma) of Sebastian Genetti awarded in 1573 to this branch of the Genetti family (shown here). 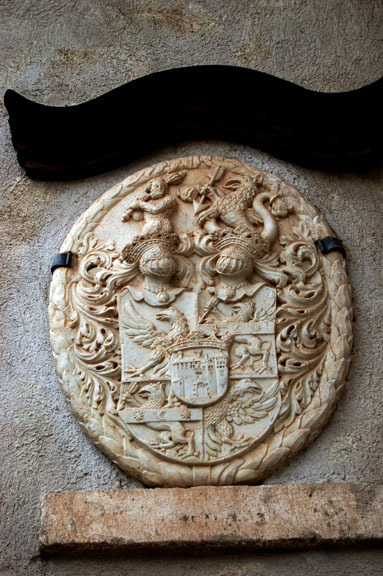 It pictures the Wild Man of the Alps and is very different from the modern coat-of-arms that hangs above the doorway of the Genetti homestead in Castelfondo. Sebastian’s line became extinct in 1646 and his family “stemma” was no longer used as there were no direct male heirs to inherit the title. 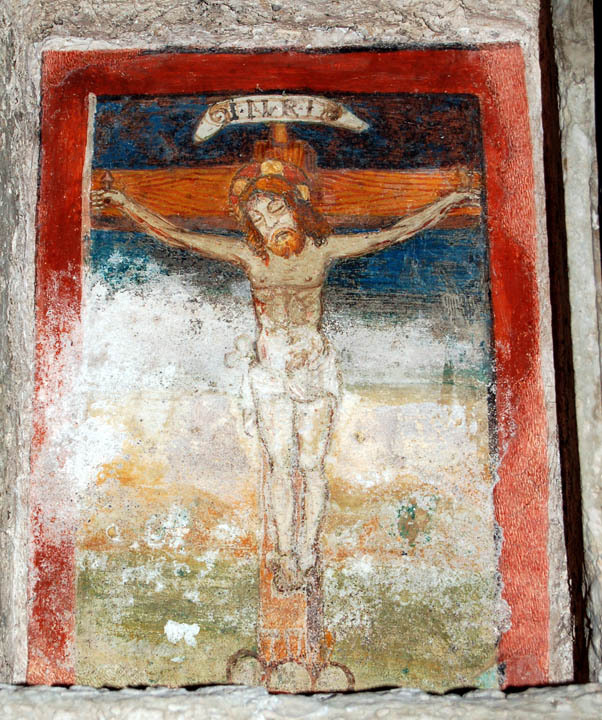 A tiny painted crucifix from the original 16th century church can be found in a wall niche to the left of the altar. 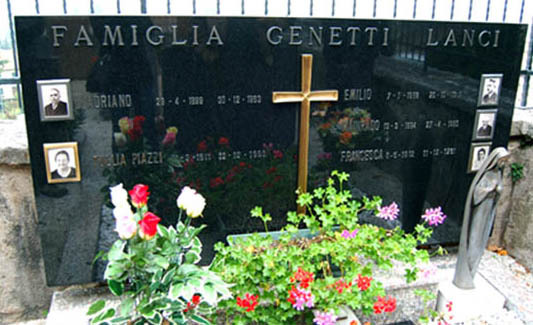 The small, peaceful cemetery located next to San Nicolo church contains many familiar surnames (Genetti, Zambotti, Marchetti, Lorenzetti, Cologna). Family members are responsible for the upkeep of graves. This quiet churchyard is the final resting place for many of our ancestors. Due to limited space, plots are “recycled”. When a burial reaches a certain age or there is no longer family to take care of the grave, the bones are exhumed and placed in a common crypt and a new burial takes its place. 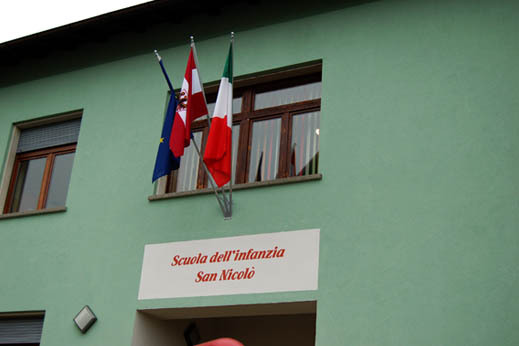 Behind the church is Scuola dell’infanzia San Nicolo (San Nicolo Kindergarten). 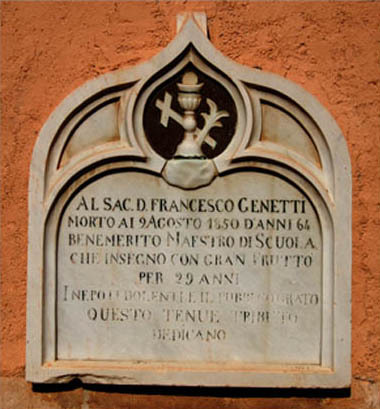 Within the front hallway of the building you will find a plaque and portraits in memory of Damiano and Oliva Genetti. Their estate helped establish the school that originally began as an orphanage for girls. 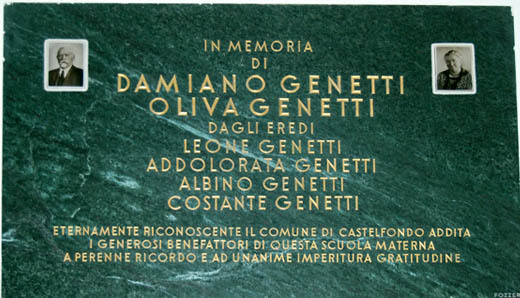 Plaque dedicated in memory to Damiano and Oliva Genetti (my great-grandparents). We welcome all contributions to the Genetti Family Gallery. Please send photos as JPG files attached to an email (no more than 8 attachments per email). Include information for each photo so we can give it a caption (names, dates, location). Send to Louise Genetti Roach. Click here for email link. This is wonderful. I haven’t visited this page in a few years, but I’m “back” and getting ready to do research again.